with extra power for lights and accessories! 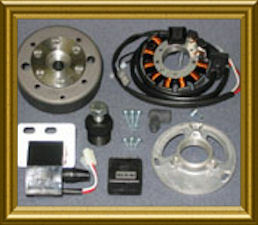 Complete conversion ignition kits for Vintage Husqvarna Motorcycles. The PowerDynamo upgrades your old-style points ignition to a modern electronic ignition that meets today's standards. This electronic ignition has a hotter spark that can fire more rapidly giving you better starting (1-2 kicks) with MORE bottom-end and top-end power. A lot of customers say the bike runs better than it did brand new. Comes with everything to completely replace your entire ignition system all the way down to a new spark plug wire and boot. PowerDynamo also has extra wattage that enables you to run lights and accessories. Guaranteed to make your Husqvarna start easier and run better than it did when new!